15.06.18 10:26;Account;Receive;Received Payment 4.7 USD from account U16400125 to account U1294000. Batch: 218045292. Memo: API Payment. Withdraw to allhyips from beinforbes.club. 16.06.18 18:18;Account;Receive;Received Payment 4.7 USD from account U16400125 to account U1294000. Batch: 218153081. Memo: API Payment. Withdraw to allhyips from beinforbes.club. 18.06.18 08:51;Account;Receive;Received Payment 4.7 USD from account U16400125 to account U1294000. Batch: 218261922. Memo: API Payment. Withdraw to allhyips from beinforbes.club. 17.06.18 13:02;Account;Receive;Received Payment 4.7 USD from account U16400125 to account U1294000. Batch: 218200417. Memo: API Payment. Withdraw to allhyips from beinforbes.club. 19.06.18 11:08;Account;Receive;Received Payment 4.7 USD from account U16400125 to account U1294000. Batch: 218365339. Memo: API Payment. Withdraw to allhyips from beinforbes.club. 20.06.18 11:24;Account;Receive;Received Payment 4.7 USD from account U16400125 to account U1294000. Batch: 218471080. Memo: API Payment. Withdraw to allhyips from beinforbes.club. 21.06.18 11:07;Account;Receive;Received Payment 4.7 USD from account U16400125 to account U1294000. Batch: 218565036. Memo: API Payment. Withdraw to allhyips from beinforbes.club. 23.06.18 09:27;Account;Receive;Received Payment 4.7 USD from account U16400125 to account U1294000. Batch: 218742485. Memo: API Payment. Withdraw to allhyips from beinforbes.club. 22.06.18 20:08;Account;Receive;Received Payment 4.7 USD from account U16400125 to account U1294000. Batch: 218710725. Memo: API Payment. Withdraw to allhyips from beinforbes.club. 25.06.18 10:10;Account;Receive;Received Payment 4.7 USD from account U16400125 to account U1294000. Batch: 218910391. Memo: API Payment. Withdraw to allhyips from beinforbes.club. 24.06.18 10:18;Account;Receive;Received Payment 4.7 USD from account U16400125 to account U1294000. Batch: 218824576. Memo: API Payment. Withdraw to allhyips from beinforbes.club. 26.06.18 09:04;Account;Receive;Received Payment 4.7 USD from account U16400125 to account U1294000. Batch: 219001283. Memo: API Payment. Withdraw to allhyips from beinforbes.club. 28.06.18 10:35;Account;Receive;Received Payment 4.7 USD from account U16400125 to account U1294000. Batch: 219214662. Memo: API Payment. Withdraw to allhyips from beinforbes.club. 27.06.18 09:45;Account;Receive;Received Payment 4.7 USD from account U16400125 to account U1294000. Batch: 219112669. Memo: API Payment. Withdraw to allhyips from beinforbes.club. 30.06.18 08:11;Account;Receive;Received Payment 4.7 USD from account U16400125 to account U1294000. Batch: 219384933. Memo: API Payment. Withdraw to allhyips from beinforbes.club. 29.06.18 11:19;Account;Receive;Received Payment 4.7 USD from account U16400125 to account U1294000. Batch: 219313554. Memo: API Payment. Withdraw to allhyips from beinforbes.club. 01.07.18 09:31;Account;Receive;Received Payment 4.7 USD from account U16400125 to account U1294000. Batch: 219677471. Memo: API Payment. Withdraw to allhyips from beinforbes.club. 02.07.18 14:32;Account;Receive;Received Payment 4.7 USD from account U16400125 to account U1294000. Batch: 219908773. Memo: API Payment. Withdraw to allhyips from beinforbes.club. 03.07.18 11:03;Account;Receive;Received Payment 4.7 USD from account U16400125 to account U1294000. Batch: 219997580. Memo: API Payment. Withdraw to allhyips from beinforbes.club. 05.07.18 11:26;Account;Receive;Received Payment 4.7 USD from account U16400125 to account U1294000. Batch: 220203355. Memo: API Payment. Withdraw to allhyips from beinforbes.club. 04.07.18 19:28;Account;Receive;Received Payment 4.7 USD from account U16400125 to account U1294000. Batch: 220143800. Memo: API Payment. 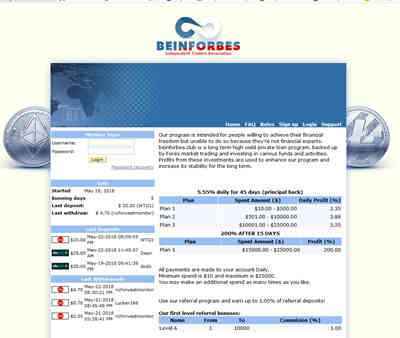 Withdraw to allhyips from beinforbes.club.